Napa Live: Inside & Out Napa's music crawl is back for its third year, and includes four days of live bands, food and other fun within walking distance. Thirty-five locations inside and out offer music ranging from blues to funk to rock, with local venues, shops, plazas, patios, restaurants and more hosting on July 8, Aug. 12, Sept. 9 and Oct. 15. Noon to 6pm. Free admission. 707.257.0322. MidSummer MusiCamp Founded in 1990, the Napa Valley Music Associates aims to develop the artistic potential of Napa Valley students with year-round music instruction. Each summer for the past 24 years, the highlight of these lessons is the MidSummer MusiCamp, and this year's series includes special programs for kids age 4 to 17. The strings program offers classes for violin, viola and cello July 9–13, and the woodwinds and brass program provides instruction on clarinet, saxophone and more July 16–20. Both programs are for intermediate and advanced-level students, though kids with or without musical backgrounds are invited to the Joy & Fun: Creating Music program, July 23–27, that features special drumming and singing classes. Programs take place at Hillside Christian Church, 100 Anderson Road, Napa. Times and costs vary. 707.322.8402. Shakespeare in the Cannery Santa Rosa's unique outdoor theater experience—set in the brick ruins of a former canning warehouse—returns for its fifth and reported final season. Lead by director David Lear, the company is planning to go out in style, presenting the comedic and heart-warming Shakespeare in Love at sunset on select dates, July 12–Aug 3. 3 W. Third St., Santa Rosa. Gates at 5pm, shows at 7pm. 707.528.3009. Sonoma Arts Live Nonprofit theater company wraps up its season, themed "The Way We Were," with the heartfelt musical Always . . . Patsy Cline, July 13–29. Based on Cline's true-life friendship with fan-turned-friend Louise Segar, the show features over two dozen classic hits. In the middle of that run, the company welcomes playwright and actor Del Shores to perform his hit one-man-show Six Characters in Search of a Play, on July 22. The Rotary Stage in Andrews Hall at the Sonoma Community Center, 276 E. Napa St., Sonoma. sonomaartslive.org. Rivertown Revival The Friends of the Petaluma River once again present the "Greatest Slough on Earth," and this year's outing aims to support the region's regrowth after last year's natural disasters. The event features local artists and bands like the King Street Giants, the Crux, T-Luke & the Tight Suits, and Big Kitty performing, interactive art installations, kids activities, local food vendors and more. The eco-friendly event even boasts a Nautical Mass commute by boat, led by a historical schooner. Revive your summer on July 14 at the McNear Peninsula at D and Copeland streets, Petaluma. rivertownrevival.com. Wine Country Comedy Fest Local grape-stomping and funny-bone smashing company Crushers of Comedy hosts its third annual summer standup extravaganza with a diverse lineup of comedians, including Steve Ausburne, Jenny Yang, Josh Argyle and many others. A slew of craft beers, winetasting, live music and more come together July 19–22 at the Laugh Cellar, 5755 Mountain Hawk Way, Santa Rosa. crushersofcomedy.com. Festival Napa Valley Formerly called the Festival del Sole, this annual event offers more than 60 events over 10 days, ranging from concerts and dance performances to vintner-led luncheons and free community events. Highlights include opening night's Opera Under the Stars at Meadowwood with soprano Nadine Sierra, the Arts for All Gala in St. Helena with actress and singer Kristin Chenoweth, Joshua Bell performing the Academy Award–winning music from the film The Red Violin and a Leonard Bernstein centennial celebration. July 20–29, at various venues in the Napa Valley. festivalnapavalley.org. Healdsburg Arts Festival Feast your eyes on a world of visual art showing throughout the Healdsburg Plaza, presented by Healdsburg Center for the Arts in collaboration with the city. July 27–29. Downtown Healdsburg. 10am to 3pm. Free admission. healdsburgcenterforthearts.org. Napa Porchfest A music fest unlike any other, the annual Porchfest places Napa's finest musicians on porches throughout the city's historic homes for an afternoon of dozens of intimate performances within walking distance of each other. Stroll through the Porchfest on July 29, in downtown Napa. 12:30pm to 5pm. Free admission. napaporchfest.org. Sonoma County Fair This year's signature summer fair presents a "Salute to Heroes" and honors first responders and those who saved lives and helped others throughout last October's wildfires. In addition to the largest themed flower show in the country and horse racing, the annual affair once again offers rodeos, destruction derbys, carnival rides, local art and agriculture, and all your favorite fair cuisine. Separate admission is required for some events. The Sonoma County Fair runs Aug. 2–12. Horse racing happens Aug. 2–5 and Aug. 9–12. Sonoma County Fairgrounds. 1350 Bennett Valley Road, Santa Rosa. 11am to 9pm; $7–$12; kids six and under are free. sonomacountyfair.com. Music in the Vineyards Now in its 24th season, this nationally acclaimed chamber-music festival welcomes renowned musicians from around the world to perform at the most picturesque locations in the Napa Valley. This year, the Escher, Pacifica and Miró quartets and the Trio Machiavelli perform as the festival's ensembles-in-residence and the all-star lineup includes big band leader Maria Schneider, guitarist David Leisner, violist Nokuthula Ngwenyama and pianist Michael Brown. Aug. 3–26, at winery venues in the Napa Valley. $55 and up. musicinthevineyards.org. Petaluma Music Festival The 11th annual festival benefiting music programs in Petaluma schools features another massive lineup of North Bay favorites like headliners Railroad Earth, the Brothers Comatose, Melvin Seals and JGB, Royal Jelly Jive and many others. Aug. 4 at the Sonoma-Marin Fairgrounds, 175 Fairgrounds Drive, Petaluma. Noon. $55–$65 and up; students ages 13–17 can get limited $20 tickets at the door; kids 12 and under are free with adult admission. petalumamusicfestival.org. Gravenstein Apple Fair Billed as the "sweetest little fair in Sonoma County," the 45th annual event, presented by Sonoma County Farm Trails, celebrates the locally found Gravenstein apples in all their delicious glory, with several food vendors, live music and local arts and crafts. Look for the artisan tasting lounge, the farm life arena, kids activities and games and contests throughout. Aug. 11–12 at Ragle Ranch Park, 500 Ragle Road, Sebastopol. 10am to 6pm. $8–$15; kids five and under are free. gravensteinapplefair.com. Cotati Accordion Festival Bay Area accordion veteran Paul Rogers of Those Darn Accordions and the Christmas Jug Band is saluted as the honorary director, and an international cavalcade of stars takes the stage at this 28th annual squeezebox party, which this year offers two days of peace and music in a Woodstock-themed affair. 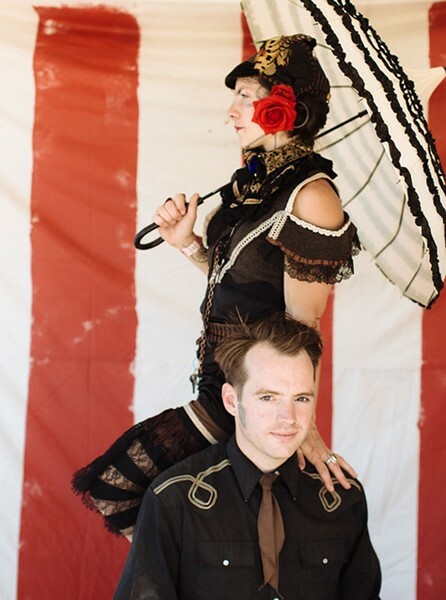 International stars like Finland's Netta Skog and Germany's Matthias Matzke perform, as well as local favorites like the Zydeco Flames, Culann's Hounds, Oddjob Ensemble and the Mad Maggies. Aug. 18–19 in La Plaza Park. Old Redwood Highway, Cotati. 9:30am–8pm. cotatifest.com. Blues, Brews & BBQ Mixing together live music, microbrews and enough barbecue to fill a pickup truck, this summertime party is not to be missed. There's a rib-eating contest, kids area and, of course, blues artists all along the streets. Aug. 25 at First and Main streets, Napa. Noon–6pm. Free admission, beer tasting tickets available for purchase. donapa.com. Bodega Seafood Art & Wine Festival Dozens of culinary companies come together to offer delicious seafood specialties at the 24th annual event. Aside from the art and the eats, there are four stages of entertainment. The Main Stage features blues, jazz, swing, bluegrass and more from the likes of the Highway Poets, Kevin Russell, Sang Matiz, Swing Fever and French Oak. Other entertainers, ranging from jugglers, magicians and other nonmusical acts, join in on the fun. And local art, food, wine and beer overflows Aug. 25–26 at Watts Ranch, 16855 Bodega Hwy. Saturday, 10am–6pm; Sunday, 10am–5pm. $15–$20; kids under 12 are free. bodegaseafoodfestival.com. Cochon 555's Heritage Fire Napa Dozens of grills light their fire to roast and cook responsibly raised meats ranging from pig to rabbit and duck. Over 50 chefs and butchers offer up the succulent creations, paired with wine from several small wineries and artisan cheeses and other bites. The outdoor banquet commences on Aug. 26 at Charles Krug Winery, 2800 Main St., St. Helena. 3pm. $150 and up. cochon555.com. Taste of Sonoma Labor Day weekend belongs to wine at this signature event from the Sonoma County Vintners group. This year's event makes the most of its home at Sonoma State University's Green Music Center, gathering wineries from across the region to pour hundreds of wines that can be paired by bites from dozens of local chefs. The event also hosts seminars and demonstrations that cover a wide range of wine topics to tickle the intellect and stir the imagination. You can also upgrade the experience with an optional Club Reserve package that gets you in early and intimate with local winemakers. Sept. 1. 1801 East Cotati Ave., Rohnert Park. Noon to 4pm. $180–$255. tasteofsonoma.com. Music Festival for Brain Health The most successful mental-health event in the country, in terms of raising both money and awareness, returns for a 24th year of science symposiums and chart-topping songwriters. There's also a winetasting reception featuring several top North Bay wineries, a VIP dinner and a special guest chef. Sept. 15 at Staglin Family Vineyard, 1570 Bella Oaks Lane, Rutherford. music-festival.org.